Photo published by the Medal Collectors. Adams, John Weston (1936-Present), 19 Marsh Street, Dedham, Massachusetts. Investment Banker, Author, Numismatist, Collector of Coin Auction Catalogs, Early American Coppers and Colonial and United States Medals, and Antiquarian. Portrait of John Adams by Regina Adams. He was born on April 2, 1936 at Boston, Massachusetts. On August 29, 1959, he married Mary Markle Pierce (-1998). They have three children. From 1960 to 1961 he worked in the research department for the firm of Kuhn Loeb & Company, New York, New York. From 1961 to 1966 he served as the Assistant Treasurer of Corning Glass Works. Chairman of Adams, Harkness & Hill. Canaccord Adams, Ltd., investment bankers, Boston, Massachusetts. Fellow of the Massachusetts Historical Society, the ANS, and the American Antiquarian Society. In 1976 he was the editor of Monographs on Varieties of United States Large Cents 1793-1794. In 1982 he sold his collection of 1794 Large Cents through Bowers and Ruddy Galleries, who published the landmark catalog, The Celebrated John W. Adams Collection. On March 13, 1989, he sold the first of three parts of duplicate copies of books from his library through The Money Tree, with the second part on February 26, 1990, and the third part on July 30, 1990. On June 1, 1990 he sold a part of his library through George Kolbe. On January 6, 1999, he sold his collection of Indian Peace Medals of George III through Stack’s, New York. In 1999, he published, The Indian Peace Medals of George III. On June 28, 2000 he married Regina Fromhage. About 2005 he became the editor of Medal Collectors Advisory to the present. In 2006, he published, The Medals Concerning John Law and the Mississippi System. From 2007 to 2009, he served as the President of the Numismatic Bibliomania Society (NBS). In 2007, he co-authored with Anne Bentley, Comita Americana and Related Medals. In 2009 the Numismatic Bibliomania Society conducted a survey of the 100 Greatest Items of United States Numismatic Literature, where Adams is distinguished by three works that are on the list : United States Numismatic Literature. Volumes 1 & 2, ranked No. 21; co-authored with Anne Bentley, Comita Americana and Related Medals ranked No. 78 on the list, and Bowers and Ruddy Galleries, who published the landmark catalog, The Celebrated John W. Adams Collection, ranked No. 80. In 2010, he co-authored with Fernando Chao, The Medallic Portraits of Admiral Vernon. 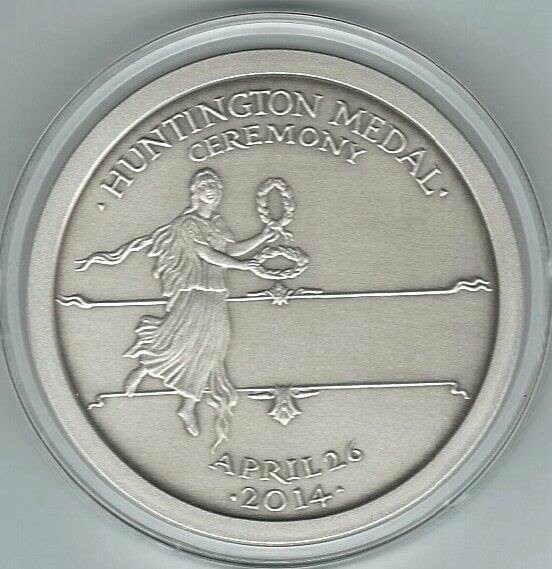 Link to Medal Collectors page with biography of Mr. John Weston Adams. 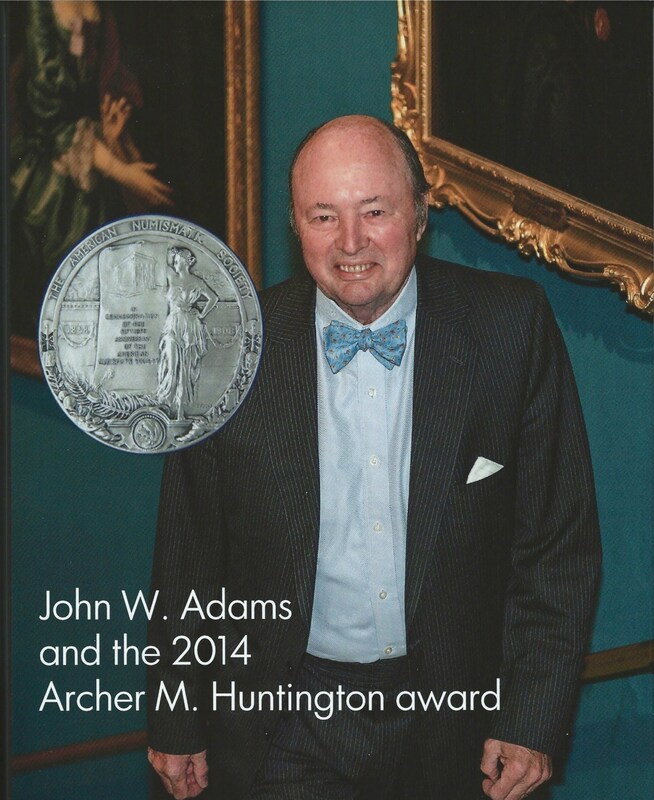 On Saturday April 26, 2014 the inestimable John Weston Adams was presented with the Archer Milton Huntington Award by the American Numismatic Society at Boston in the Dowse Library of the Massachusetts Historical Society. Some of the details were published in the weekly E-Sylum, under the fine editorship of Mr. Wayne Homren. Photos, testimonies and other commentary of this marvelous convivial celebration are found in the link below. Photo on Dust-Jacket of Bob Williams book. More photos taken by the inept photographer John N. Lupia III will follow when time permits together with his observations regarding the illustrious Mr. & Mrs. Adams and the wonderful event we all celebrated with great joy. It was an honor and a privilege to be invited by John W. Adams as a guest to his presentation of the Archer H. Huntington Award ceremony at the Dowse Library of the Massachusetts Historical Society and to the splendid Gala event at The Country Club, Chestnut Hill, Massachusetts. Preparations were made, flights, tickets, car rentals, hotel booking, EZ-Pass rental, but most of all the GPS rental. Now this GPS device is known to all as the navigator's friend, except when downtown Boston. It takes you from highway to highway with ease, but cannot get you anywhere but lost in Boston. It tells you to make a right when it is a one way going left. It politely recalculates your destiny with better wrong instructions all to no avail. Of course, this happened at the most inopportune time with every good effort to arrive at the Dowse Library 45 minutes early because I had important news just published the day before regarding the epidemic of furunculosis that killed 90,000 trout in New Jersey. 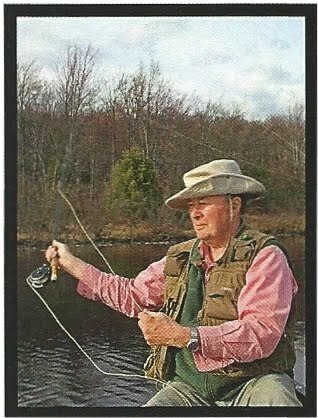 This news is urgent to John W. Adams because he is the fish warden in the Adirondacks, New York, where he enjoys fly fishing with friends and family, not far from the summer home of Henry Chapman. So with GPS ripped out of its window mounting bracket now in hand looking for a peening hammer but not finding one I arrived 5 minutes into John's talk, devastated and shamed at being late. Feeling like the school boy dunce I blessed myself awaiting the cane by the schoolmaster but there was none. So I quickly sat at the only available seat next to Weston Adams, John's brother, and lecture with notes, and melodious delivery continued uninterrupted. The occasional humorous anecdote spoken by John Adams was just the foreshadow of the evening unravelling and turning into a convivial dinner banquet reminiscent of the Tuesday Club held in Baltimore circa 1745-1756, with Joel Orosz filling in for the hallowed Scottish physician Dr. Alexander Hamilton. Returning to our tardiness back at the Dowse Library, I was very pleased no one brought it up. Wine was poured, le fromage de Roquefort was eaten, and the the joyful sound of so many illustrious guests convened together warmed the atmosphere to the delight of our heart of hearts. Informed it was time to hop aboard the shuttle to the Gala we were led like sheep down the stairs out the front door into our bus to enjoy the evening. Fortunate for me Anne Bentley sat besides me and we began to talk as the wheels on the bus went round and round, round and round, round and round . . . when in mid sentence I mentioned to Anne something or other about when we get back to the Massachusetts Historical Society after the dinner to her surprised expression, at which moment she politely corrected me and informed me that we were not returning since the building was locked as soon as we left. To her surprise was my shocked expression since my coat with rental car keys safely tucked away in coat pocket hung in the coatroom and our beloved but unsmashed GPS tucked neatly in locker 215. I showed Anne the key with its brass grommet tag with locker number neatly placed about the white card stock surrounded by the brass ring and she said, "O my dear!" So text messages and voice mail recordings were sent by the dozen so that arrangements could be made with the manager to meet me after the Gala, and for the penitent Lupia to get his car keys to return to his hotel, otherwise reservations plans would have had to be extended until Monday, April 28th. With that aside, the Gala went on with great joy and conviviality to everyone's amusement led by the conductor Joel Orosz of the spoken music played in good clean fun-loving jest, ribbing and roasting, while Joel was happily toasting John Adams. With comical stories taken from his life reminisced by his family and friends were chanted aloud a cappella to the amusement and gaiety of all present accompanied by sounds of laughter all night long. With hearts filled with warm empathy and deep admiration for our most honored guest everyone congratulated him with smiles and handshakes wining and dinning throughout the evening. They say behind every great man stands a great woman, and in the case of Regina Adams who is the living exemplar John stands in the fore as our heroic champion of American history in the vast but sometimes esoteric field of numismatics! Congratulations to you both! Arthur Houghton and John N. Lupia, III. Photo sent in private email by John Adams, hopefully with permission. honoring ANS longtime benefactors Regina and John W. Adams with the Trustees' Award.